Gave Up Chocolate? Break that Resolution! If removing chocolate from your diet was part of your New Year’s resolution, then maybe it’s time to break it – for your own good! Dark Chocolate has often been touted in health magazines as a powerful antioxidant, and also gives you the benefits of improved brain activity and blood flow, and may help reduce blood pressure. It’s the flavonols in chocolate that help prevent insulin resistance, which is associated with Type II Diabetes. Flavenols are also found in vegetables, such as celery, parsley and thyme, and fruits like apricots, apples, and grapes, as well as red wine and tea leaves. But chocolate has the highest concentration of flavenols of all these foods. Another study done at the Karolinska Institute in Sweden found that cacao, the bean from which chocolate is made, is found to be a “defense shield” against strokes, because of its positive impact on the cardiovascular system. A ten year study showed that subjects who ate the most chocolate were 17% less likely to suffer a stroke. The study’s researchers attributed this to the anti-clotting and anti-inflammatory properties of chocolate. It is also possible, they said, that the flavonoids in chocolate may decrease blood concentrations of bad cholesterol and reduce blood pressure. What’s more, dark chocolate is found to be a mood booster. Its is purported to increase levels of endorphins (natural opiates) produced by the brain as well as serotonin, a mood-boosting substance also produced by the brain. Increasing serotonin production in the digestive tract may also boost your immune system . And, the higher the percentage chocolate (the darker the chocolate), the better. Dark chocolate is made with less sugar, and has a higher concentration of pure chocolate, which contains all the beneficial substances. 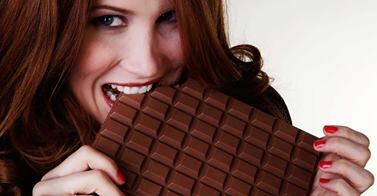 But don’t overdo it – the recommended daily intake of dark chocolate is one ounce per day. So, update that resolution, and add some chocolate to your shopping cart today. Try our Dark Chocolate Squares, Almond Bark, or a Dark Chocolate rose today. It’s a delicious way to improve your health! Next Next post: Spencer Trappist Ale and Trappistine Chocolates Pair Well!